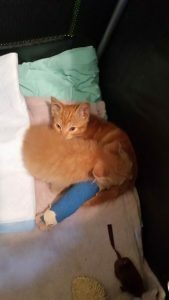 Cheddar & Chower's story is one that is tragic yet amazing. These two little kittens aren't giving up the fight! 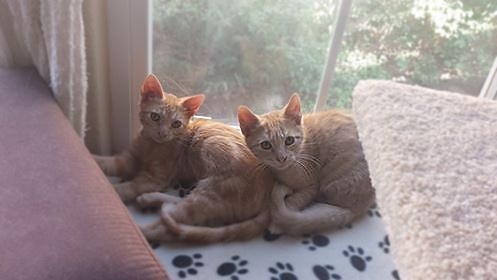 These two kittens Cheddar and Chowder have truly been through the ringer! They were rescued by Andie Allan a few months go. Andie runs a small rescuing group called Foster Fur Bottle Baby or FFBB for short. 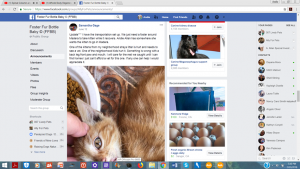 Their goal is to rescue kittens, puppies, and other fur babies and assist with rehoming them. A couple months ago, they came across two kittens Squanto and Leo who we now know as Cheddar and Chowder. They’ve spent and worked very hard and rehabilitating them. In fact, these two kittens are still spinning in circles through their recovery. Their immune systems were shot and although surgery and major medical has already been done there is still more left to do. 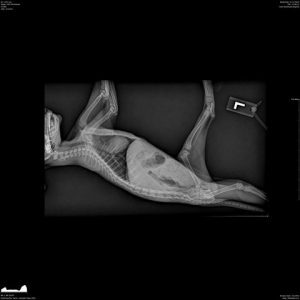 At Free Animal Doctor, we do not typically do these campaigns, however, we’ve made an exception today for Andie’s organization. 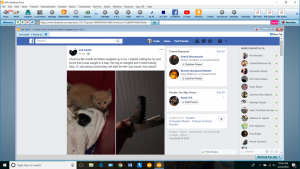 This fundraiser is for a past due medical bill.”Unless I can recoup this money” Andie says “I cannot continue to rescue or help more animals that need the help”. Previous to these out standing balances, Andie spent over $1500 on Chowder and Cheddar’s medical treatment. This $2k balance is very difficult for her to come up with, especially since her organization is small scaled. Andie loves what she does and would have it no other way. “If I didn’t rescue them and have them treated, they would’ve died” Andie states. There was no time to raise money so she acted quickly. Now Cheddar and Chowder are on their long road to recovery and Andie will make sure they get there. Chowder was stuck in an inhumane, metal jaw, leg -hold trap. 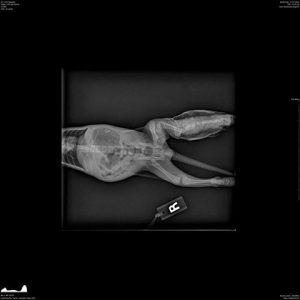 His rear left leg was shattered (see x-ray) and he developed an infection that could not be controlled despite the two different antibiotics that were administered along with pain and inflammation medication. 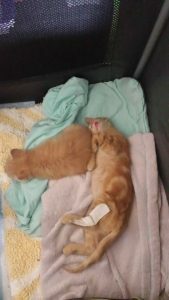 Chowder’s tissue was dying and immediate amputation was performed to save him. Surgery and recovery went well. Soon after, it was discovered that Chowder had ringworm. besides his compromised immune system, Chowder had yet another problem to face and another round of treatment to undergo. 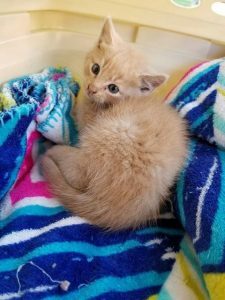 At only 4 weeks age, this orange tabby fought against all odds to stay alive and he’s still doing so until this day. Cheddar’s story feels far more sinister. 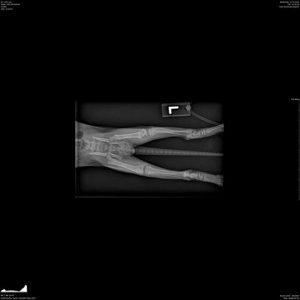 He was allegedly beat up by a kid and as a result had a broken hip, broken left rear leg, broken and de-gloved jaw, and a bruised neck area. A week after being rescued, he developed water in his lungs and was knocking on death’s door. There was also some air around the lungs and possible secondary head trauma. The procedure to drain lungs and air was done right away. Poor Cheddar stopped eating and lost and unhealthy amount of weight in the process and as a result, became anemic. Luckily, his blood test indicated he had no other diseases. In what might seem like a miracle, Cheddar began to eat again and gained all his weight back! His food is served with supportive supplements such as colostrum, glandulars, transfer factor, and probiotics. What a nightmare for these poor kittens! A nightmare, that they’re unfortunately still living. Thankfully they have Andie by their side and with her knowledge, she’s working hard at rebuilding their immune systems and making sure they live a happy, normal, Kitty Cat life. With these kind of campaigns, anything helps! And of course, we appreciate the support! Wish I had more to d…onate right now. What you do is such a good thing. You are an angel. These poor kitties have gone through so much, and they're just babies! I see that time's running out, I hope this runs again so you can get some well deserved help. I have a soft spot f…or gingers. I hope these babies find all the love they deserve after such a rough start! There are many things that can make a campaign successful. 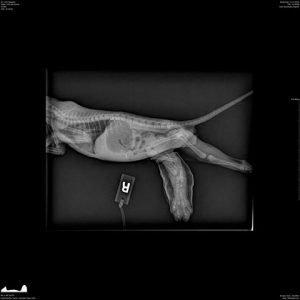 At Free Animal Doctor we measure our success in two different ways. Did the animal or animals receive treatment? Were we able reach our campaign goal? 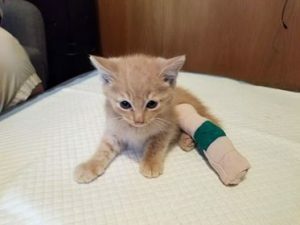 Luckily, Cheddar and Chowder had already received medical treatment and this fundraiser was to help Andie put some money towards these two kittens medical bill. W're glad we were able to pay a small amount towards it. 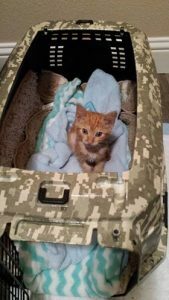 Andie will continue to rescue kittens and do all she can to save their lives! In the case of Cheddar and Chowder, they're doing much, much better. There so close to living happy and healthy lives and we appreciate your support in helping Andie keep it that way!